First 7 days of application: Add 4-8 pints of DUST ATTACK for every 1,000 gallons of water. Apply with every water application for one week. This high rate accelerates the agglomeration of dust particles. After 7 days: Assess the dust control from the initial applications. 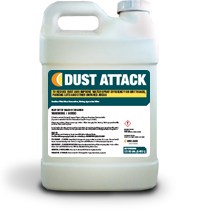 The rate of DUST ATTACK can be reduced to 1-4 pints per 1,000 gallons if the dust control is at an acceptable level. If it is not, return to 4-8 pints per 1,000 gallons of water and apply for an additional seven days. Ongoing: Once an acceptable level of dust control is attained reducing DUST ATTACK applications can be tried and evaluated. If the dust level increases return to the previous watering schedule.